An oceanfront dream home combines high-tech amenities and old-time workmanship. Ressurecting a rental bungalow with faux finishes and sweat equity. A spirit of renovation triggers rebirth of pride in one Southern California town. First of a two-part article on what to look for when beginning an American art tile collection. Snowy weather brings out warm memories of hearth and home. Timeless words from The Craftsman on moments of perfect joy. American Bungalow test drives a CD-ROM version of The Craftsman. Sarah Wildasin applies her Wall-Street skills to producing quality Arts and Crafts reproductions. 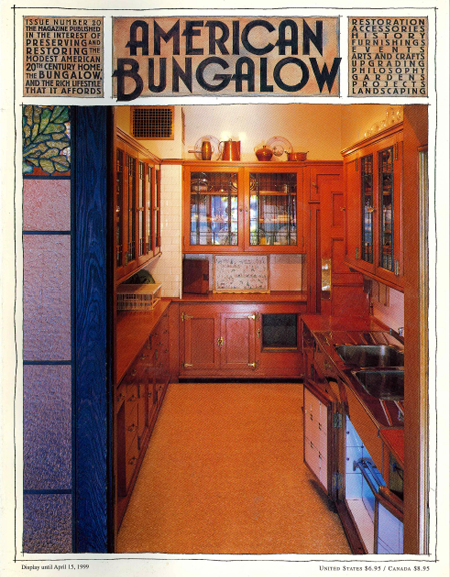 The philosophy of the Arts and Crafts movement rings a familiar bell in the ’90s.